Killarney is a a highly desirable neighbourhood for home buyers looking to live inner city. 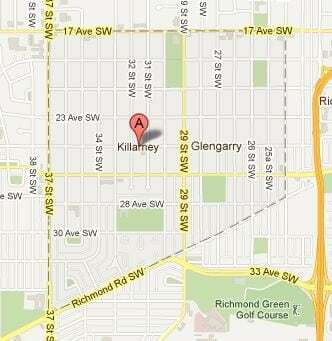 The City of Calgary started developing Killarney over a century ago in 1910. Killarney’s age and location has been a main factor in redevelopment of the overall area which really started to take off beginning approximately in 2002 with new infill home developments. Find more information on Killarney here. Killarney is well located close to all amenities and the conveniences of the inner city lifestyle with quick access to everything essential, shopping, groceries, restaurants, pubs and more. The area also has good public schools for your family and fitness options such as Killarney Recreational Centre and World Health along Richmond Rd. Find most of the essentials amenities by nearby Westbrook Mall where you will find shopping at Safeway, Wall-Mart, Starbucks, medical clinics; anything you need is located nearby. Killarney is home to two schools. Killarney Elementary School is a public school teaching kindergarten to grade six. Looking to enroll your child(s) in a great French immersion elementary school? Holy Name Elementary School is a private bilingual school located in the area as well. Students are designated to attend A.E. Cross Junior High School (public), Vincent Massey Junior High School (public) and Ernest Manning High School (public). Part of the service I provide my clients is verifying things like school districts for your children, if you have any questions about schools in Calgary’s infill communities, call me anytime! Public transportation is of no shortage in the area. With easy access to the University of Calgary via route 72 / route 73 and an abundance of main routes, you shouldn’t have any issue finding your way around town. Mount Royal University is also located close by just to the south of the area across Richmond Rd, with access made easy by the public transportation system running along the communities borders. Last but not least the new LRT is going to be walking distance for most of the area! Questions about Inner City Calgary? Call me direct anytime at 403-370-4180 or message me below using the contact form! It would be my privilege to help you accomplish your real estate goals and make sure your best interests are protected at all times. Search Killarney Home Listings Now!